If you're looking for something really unusual for your tropical marine aquarium, there's nothing quite like keeping starfish. Although they are sensitive animals which need a careful maintained environment, an experienced aquarist shouldn't find them difficult to look after. They can even help to clean the tank, and they're fascinating to watch. The most important thing to understand about keeping starfish is that they are very sensitive to change, and sudden shifts in water temperature or chemistry can be fatal. For this reason it's especially important to be careful when introducing a new starfish to your aquarium. The best method is to introduce small amounts of aquarium water into its travel container over a couple of hours, so it has time to adjust. Most starfish prefer water at around 22ºC to 26ºC. It's vital to maintain high water quality and to keep pH and salinity stable. For this reason it's a bad idea to keep starfish in a young aquarium. Once they're established, small, frequent water changes are safer than occasional larger ones. Never use copper-based medicines where starfish are present. Starfish grow to between five and twenty inches in length, depending on species. Make sure you give them enough room to move around. Providing a variety of levels or shelves for them to climb on will encourage them to be more active. In the wild, starfish live in shallow water, so they need bright light during the daytime and a regular day / night cycle in order to be happy. Most species are nocturnal but they often adapt and learn to come out in the light once they are sure their aquarium habitat is safe. You can help them to feel secure by giving them lots of hiding places - ideally crevices between rocks. As starfish are generally peaceful and slow-moving, you can keep them with most species of fish. However some more aggressive species, such as puffer fish and wrasses, can attack and injure them. Although starfish can regrow damaged limbs, ongoing bullying will cause stress related health problems and is generally fatal. Many species of starfish eat other invertebrates. Some eat corals, and they have no difficulty crunching through hard polyps, so if you have a reef tank be careful about the species you select. Starfish are scavenging animals, which means that they are willing to eat almost anything, but a balanced diet is important to keep them healthy. Some will get most of what they need by grazing on algae and live rock, whilst others will enjoy left-over fish food or small chunks of meat, fish or vegetables. On account of their delicate, gentle appearance, aquarists sometimes try to feed their starfish by hand. This is not recommended as many starfish are quite capable of holding onto a finger and doing it serious damage. Because they are so slow moving, starfish don't need a lot of energy. This means that it's easy for them to get overweight in an aquarium. Keep a careful eye on the shape of your starfish to make sure it isn't getting too plump, and be prepared to cut back on meals - you might be surprised by how little they really need to eat. There are lots of different types of starfish suitable for home marine aquariums. Bahama stars - a great choice for beginners, these squat red and orange stars are much tougher than most of their kin, though you should still be careful with them. Their preferred food is other invertebrates and they love cracking open shells. Linckia starfish - available in a dazzling array of jewel-bright colours, linckias are relatively tough grazing animals who hardly need any intervention to thrive in a stable environment. If they feel really secure they may reproduce (asexually) in your aquarium. The only downside is that they can grow quite big. Sand cleaning sea stars - although they are an unspectacular shade of beige, these starfish are very popular because of the way they sift through sandy substrates eating aquarium waste. Since they use more energy than most starfish, you will usually need to supplement this diet. Marble sea stars - among the most exotic-looking starfish and conveniently small, these solitary animals thrive on live rock. 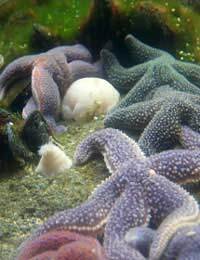 They are highly active - as starfish go - and enjoy complex environments. Harlequin serpent stars - striking to look at with their long stripy arms, these starfish don't grow huge but are happiest when they have plenty of room to move about. Chocolate chip starfish - looking just like star-shaped biscuits, these tough little starfish enjoy climbing around and will even scale the walls of your aquarium. They cannot be kept with corals.